This series, produced by Brian Reddin, celebrates the bicentenary of the Royal Canal by taking a trip along it in an old barge. 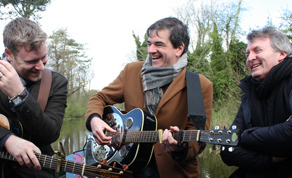 Three generations of Irish musicians, Jim Lockhart (Horslips), Fiachna Ó Braonáin (Hothouse Flowers) and singer/songwriter Fiach Moriarty travel the Royal Canal. Throughout their journey they explore some of the historical sites along the way and stop off to play music with some of Ireland’s leading musicians. Travelling at 5 km/h on an old barge while negotiating 46 locks, the pace of this series is dictated by the mode of transport. This is a nostalgic, gentle trip down a musical memory lane celebrating the songs of Ireland's past in a vessel from a bygone age. 2017 is the 200th anniversary of the opening of the Royal Canal. Following a serious decline, the Royal has been restored to its former glory. The 145 km waterway connects the Liffey to the Shannon meandering through Dublin, Kildare, Meath, Westmeath and Longford. As well as passing through some stunning and historical landscapes, the Royal flows through some of our richest musical heritage. Musicians who feature in the series include Una Healy, Mary Coughlan, Paddy Moloney, Finbar Furey, Moya Brennan, Niamh Farrell (Ham Sandwich), John Sheahan, Brian Kennedy, Duke Special, Jack L, Declan Nerney, Barry Devlin, Liam Ó Maonlaí, Julie Feeney, Patrick Bergin, Steve Wall and many others. The first episode features a journey from Lock 1 to Glasnevin Cemetery and features performances by Una Healy, Jack L, Mary Coughlan and John Sheahan.